The Old Town of Salzburg (also called Historic Centre of the City of Salzburg or simply Altstadt) is a UNESCO World Cultural Heritage Site. It comprises of a Medieval and Baroque ensemble of buildings that is unique in the world and draws millions of visitors every year. Legally, the Old Town is a district of Salzburg and building activities are strictly regulated in order to preserve the ancient buildings. Some sources that we reviewed for this article stated that the Salzburg Old Town is the biggest World Heritage Site in terms of size - we assume that this is hard to prove, but the area over which it extends is indeed remarkable. 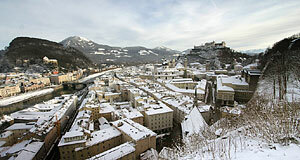 The site includes the Old Town left of the Salzach river, the inner Nonntal area, the Festungsberg hill with the Fortress Hohensalzburg, the entire Mönchsberg (the big hill right of the castle if viewed from the centre), the Old Town right of the Salzach river including Linzergasse, Steingasse and the Äußerer Stein, and the rather big Kapuzinerberg hill with the Capuchin monastery. The significance of Salzburg as a site of residence for Prince Archbishops as a spiritual centre of Central Europe goes back to the earliest days of Western-Christian culture. At the core of this well-preserved city, you will find the oldest preserved Archdiocese north of the Alps, and ancient monasteries such as St. Peter and Nonnberg, which, like the cathedral Salzburger Dom date back to Carolingian days. The Prince Archbishops have hired significant artists over the course of centuries. The Old Town of Salzburg combines Medieval and Baroque buildings into an ensemble that is dominated by the Salzburg castle, the fortress Hohensalzburg. The Old Town′s skyline is characterised by the spires and cupolas of the many churches of Salzburg, the narrow lanes and small squares of the Old Town by the colourful Baroque facades of the burgher houses on both sides of the Salzach river. The unique Old Town of Salzburg is intertwined with the spirit of Wolfgang Amadeus Mozart, music traditions and the Salzburg Festival. Whilst this might sound a bit like a promotional text written by somebody working for the official tourist information centre or some tourism-mafia hotel owner, we as determined and highly motivated Salzburgians can wholeheartedly say: It′s all true. The Old Town is magical, dive into it and enjoy! In our sightseeing section, you will find articles on all major attractions, including a highlighted list of the most important ones.